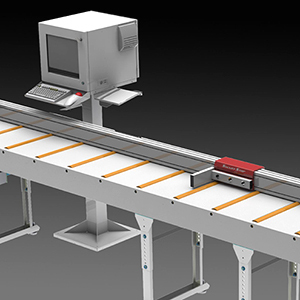 The TPS Smart-Stop is an automated lineal positioning system designed to position products quickly and accurately. Easily adapt the TPS Smart-Stop to any saw, punch, drill or other device that needs precision positioning. Using a PC with a Touch Screen Monitor, the TPS software can be configured for a number of different automated tasks. Take merge files and import them into the software for processing, use the manual move function or run pattern moves with the touch of a button. PC has built in Network port for easy connection to your internal network for file transfers, or use an optional USB wireless device to connect the computer via your wireless network. Computer ships with Windows XP Professional standard. Our touch screen allows for easy function and visibility of operation. No more staring at 2 line LCD screens, like our competitors use. Enjoy a full color 15" LCD screen with color indicators that can quickly cue the operator into current position and color backgrounds that are green if the position is within the tolerance, or red if the positioner is moved out of position. Our repeatable accuracy of .004" is due to a two part approach of using a steel tined polyurethane timing belt to avoid stretching combined with a "Smart" motor that has the controller and encoder built in. The motor knows its current position at all times without having to be recalibrated, bump it out of position and the motor will move itself back to the correct position with the touch of a button. TPS Smart-Stop's slotted extrusion design house T-Nuts that can be used to bolt the positioner to any table or select from our high grade steel table options. The TPS Smart-Stop extrustion is designed specifically to house the slide mechanism internally to prevent debris from interfering with the operation of the rail. By providing a PC controlled environment, we can easily configure the positioner for whatever task is necessary. There are 3 standard modes of operation, Manual, Cut List and Pattern. Manual mode displays a keypad to tell the positioner what distance to move to. Cut List mode allows for different cut lists to be merged and then selected for processing. Pattern mode allows repeatable pattern moves to be programmed. Software supports 16 input and output configurations for automating functions such as clamping, and saw activation. These require electronic input and output connections on the equipment for functionality. By offering the TPS Smart-Stop along with optional software levels and high grade accessories like saws and tables, we believe that this is the most complete linear positioning package on the market today. Software upgrades can add the sophistication of the DeMichele Groups’ real time lineal optimizer and inventory control software to the repeatable accuracy of our automated saw stop. Smart-Stop's are offered in standard sizes from 3' to 28' in length, as well as custom sizes based on need.